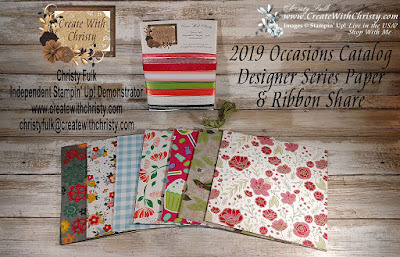 There are so many wonderful Designer Series Paper (DSP), ribbons, and accessories in the Occasions Catalog, and I know you're going to love them! Want to get a sampling of them all? 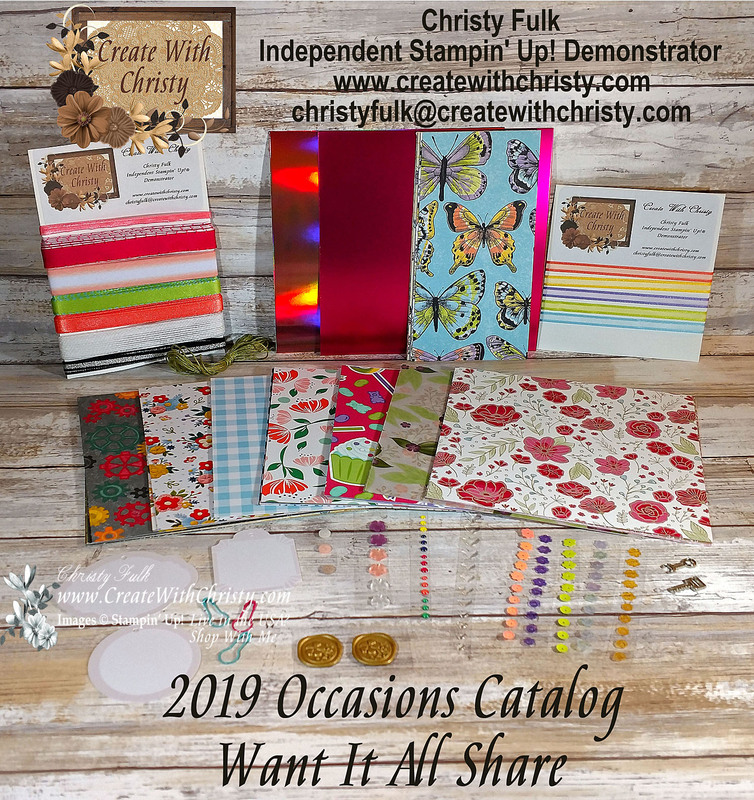 Then you'll LOVE my 2019 Occasions Catalog Product Shares! I'm offering five different product shares this time around (one with an added free gift), and they are detailed below. Please make sure to read the Reservation and Product Share Details below, too. Right now, you can reserve the shares you want, and you'll have between December 27 - January 2 to pay for them. Which share(s) you would like. No limit. If you purchase more than one share, I'll adjust the shipping to save you money, and I will give you the updated price on the invoice. 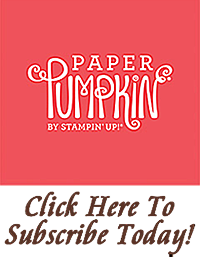 I send out a PayPal invoice beginning December 27, 2018 (per Stampin' Up! Rules). I receive invoice payment by January 2, 2019. 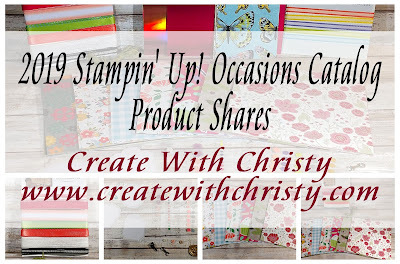 I place the order to Stampin' Up! for product shares items. I receive order from Stampin' Up!. I cut and sort products for shares. 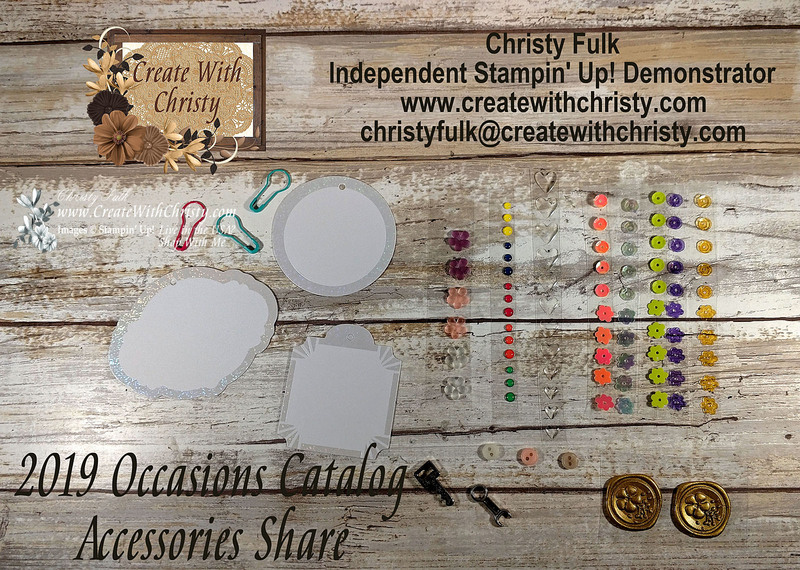 I package up the products shares. I mail the product shares out. If you reserve and pay for your product shares by January 2, I'll order the products for the shares the next day (January 3). Then, these product shares will be mailed out within two weeks after that. If I get requests for more product shares after January 2, I'll notify you of when you should expect yours. After I receive your reservation email, I'll email a PayPal invoice to you beginning December 27 (per Stampin' Up! rules). If I receive your email after this date, you'll receive your PayPal invoice within 24 hours (48 hours on the weekend) Remember, you need to have it paid by January 2 to be in on the first order. 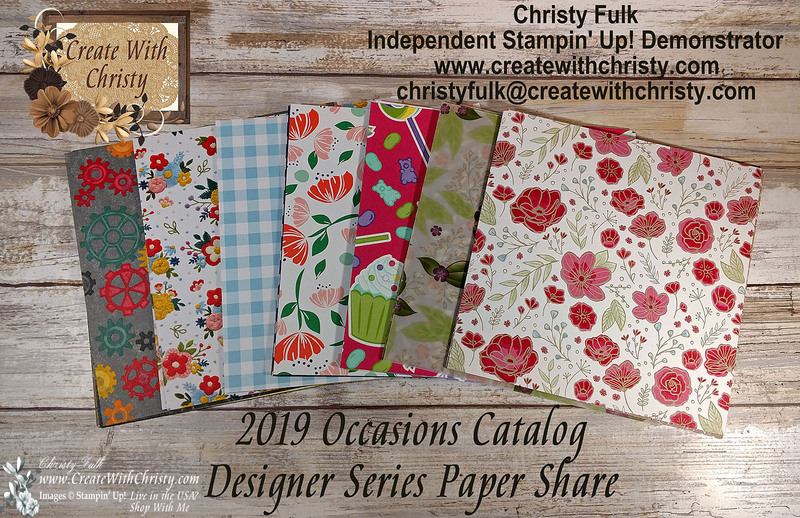 Christy's Friendly Stampers team members will get a discount on the product shares - see team newsletter. 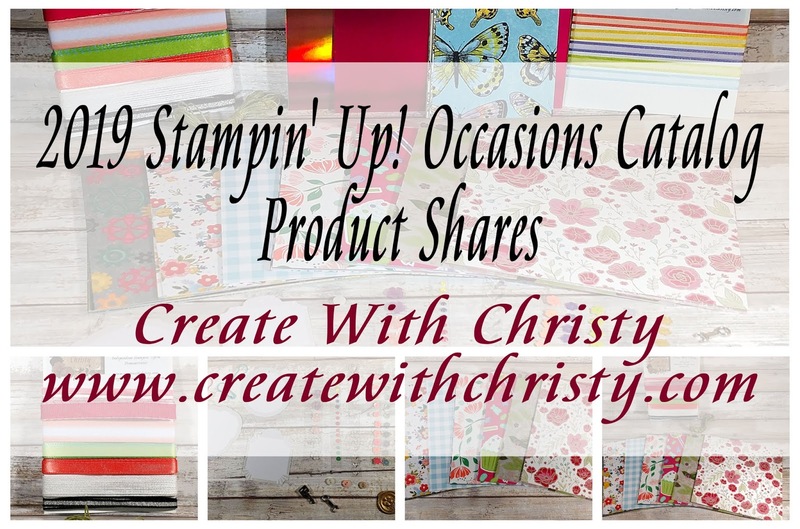 If you would love a discount on these product shares, and on all of your Stampin' Up! 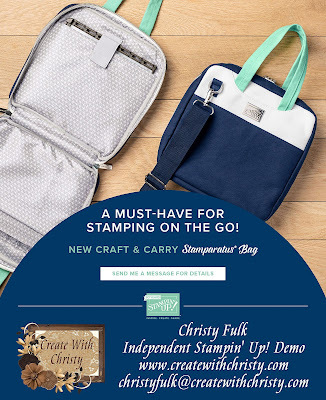 purchases, I'd love for you to sign-up to be an Independent Stampin' Up! demonstrator on my team! CLICK HERE to find out more! 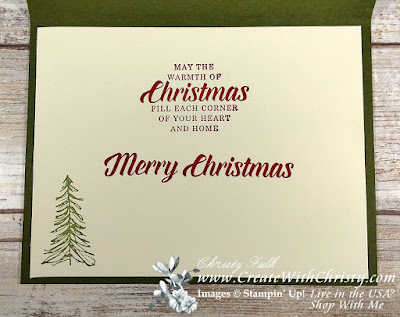 Wow, I can't believe this is my last Christmas card for 2018! Christmas is exactly a week from now, and I'm guessing all of your Christmas card-making is over. 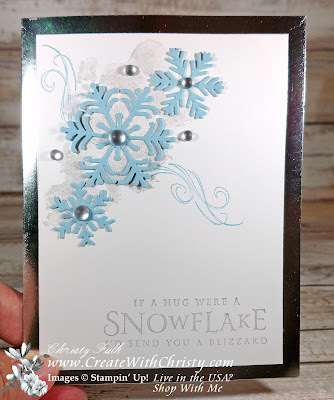 I did want to share a card I made yesterday using the Winter Woods Bundle, which includes the Winter Woods Stamp Set and In the Woods Framelits Dies. These can be purchased separately, but you'll save 10% if you purchase the bundle. 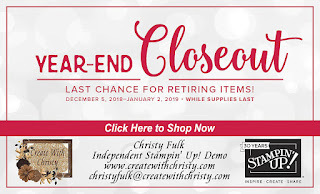 The stamp set and the dies are not retiring, but the bundle is! If you want to get your 10% off by purchasing the bundle, you only have until January 2, 2018. The dies are on backorder right now, but you can still order the bundle. You'll receive the stamp set soon, but the dies will be delivered once Stampin' Up! receives their shipment...sometime in March. As promised, I used the Stitched Seasons Framelits that were added to the Clearance Rack yesterday. 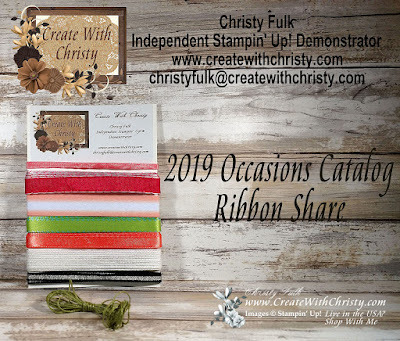 The frame dies in the set have stitching along the inside and outside of the blade, which gives you so many possibilities. 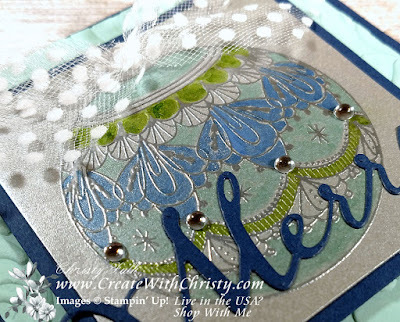 The white greeting label stitching was made with the inside stitching of the smallest frame die. The stitching around the Cherry Cobbler opening was made with the outside stitching of the medium-sized frame die. Cool, huh? Where did I get the red pearls? 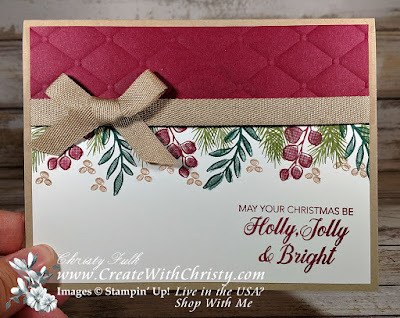 They're the regular pearls from the Pearl Basic Jewels, but I colored them with the Dark Cherry Cobbler Stampin' Blend. Die-cut the medium-sized frame die from the Stitched Seasons Framelits Dies out of the center of the Cherry Cobbler piece. The negative of the die is what is needed for the card. Emboss the piece by running it through the Big Shot with the Pinewood Planks Dynamic Textured Impressions Embossing Folder. Turn the piece over, and put SNAIL Adhesive around the frame opening. Attach the DSP piece to the center of the back of the piece, making sure to completely cover the frame opening. Fold the Mossy Meadow piece in half (fold on the top) to form the card base. 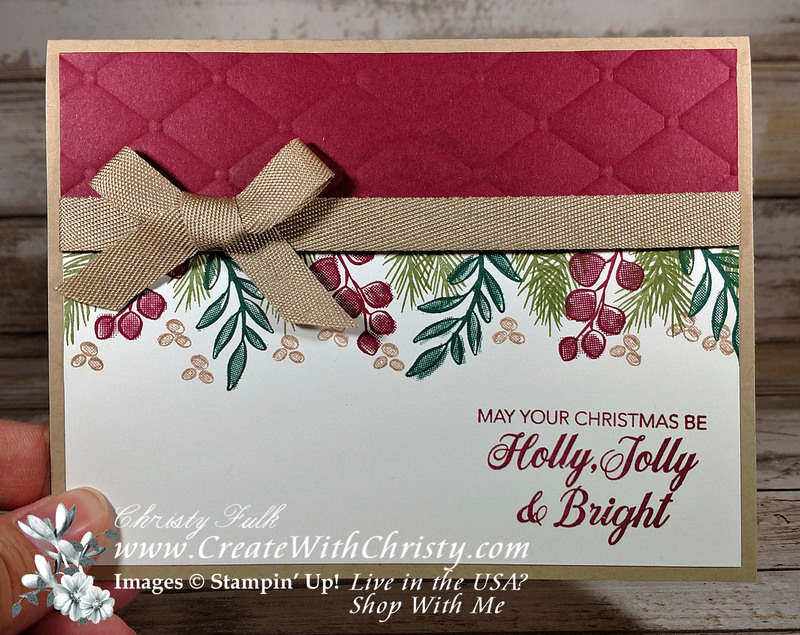 Attach the Cherry Cobbler/DSP piece to the center of the card base. Stamp the tree stamp from the Winter Woods Stamp Set onto the square Very Vanilla piece two times using the Mossy Meadow Classic Stampin' Pad. Stamp the pine branch stamp onto the piece two times using the same ink pad. Stamp the pinecone stamp once onto the piece using the Early Espresso Classic Stampin' Pad. Die-cut one of the trees out with the smaller tree thinlit die that also cuts out "branches" from the In the Woods Framelits Dies. 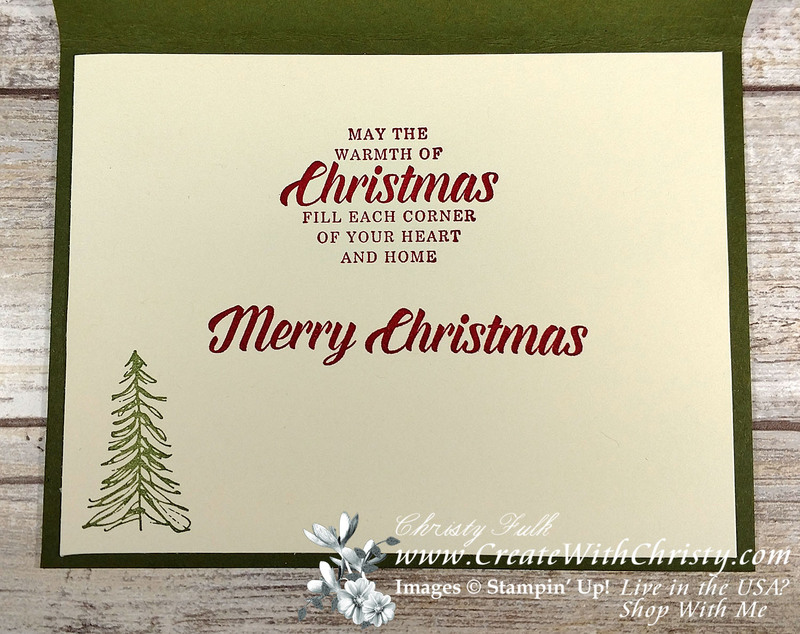 It is a little smaller than the stamped tree, so make sure to center the die when die-cutting. Die-cut the other tree out with the larger tree framelit die. Die-cut the branches out with two of the branch dies and die-cut the pinecone out with one of the pinecone dies. 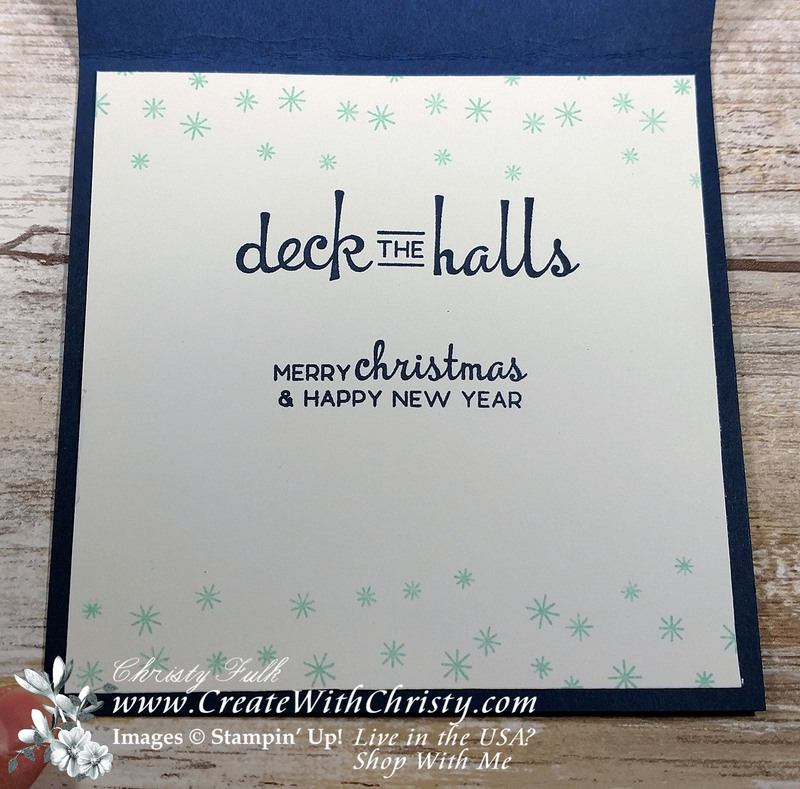 Die-cut a label out of the Whisper White piece using the the smallest frame die from the Stitched Seasons dies. 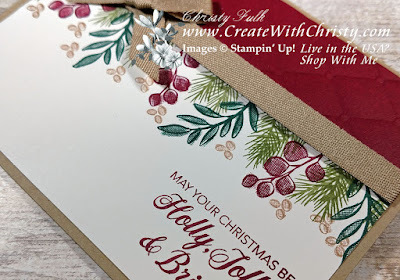 Stamp the greeting stamp onto the right side of the label using the Cherry Cobbler Classic Stampin' Pad. Attach the pinecone to the bottom, right corner of the label using a Mini Glue Dot. Attach the bottom of the pine branches to the back of the label, behind where the pinecone is, using Mini Glue Dots. Attach the label onto the DSP, centering it within the frame opening of the card. 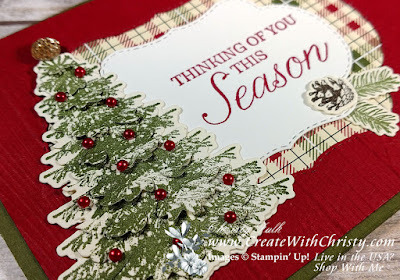 Attach the smaller, more detailed tree die-cut to the center of the larger tree die-cut. Attach it to the left side of the card (see picture). Attach a medium-sized gem from the Gold Faceted Gems to the top of the tree. Color 13 small pearls from the Pearl Basic Jewels using the Dark Cherry Cobbler Stampin' Blend. Attach the colored pearls to the tree (see picture). Inside of the Card (2nd picture): Stamp the tree stamp from the Timeless Tidings Stamp Set onto the bottom left corner of the last Very Vanilla piece using the Mossy Meadow ink pad. Stamp the "May the warmth of Christmas..." and "Merry Christmas" stamps onto the top, center of the piece using the Cherry Cobbler ink pad. 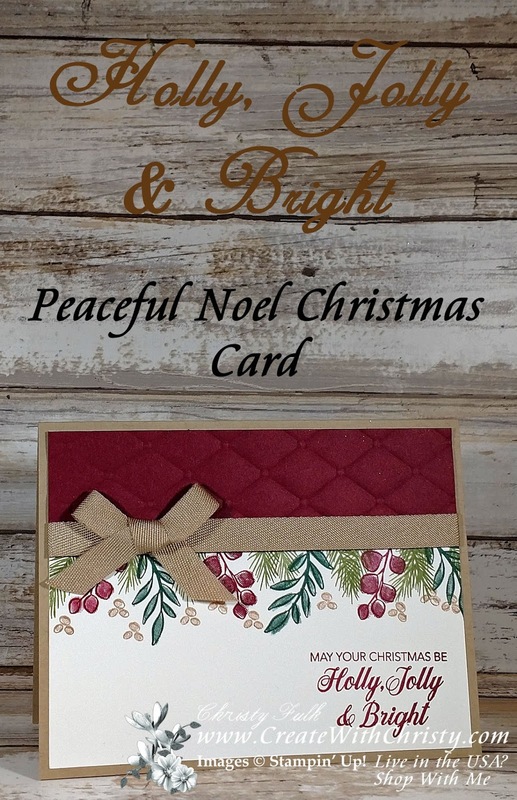 Attach the piece to the inside of the card. Supplies are limited, and with discounts up to 60%, products will go quickly. 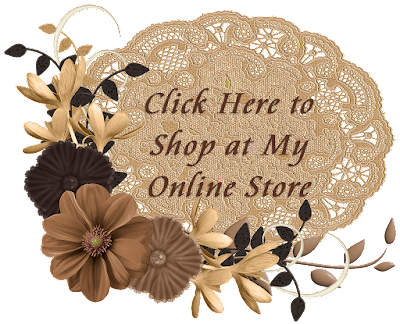 Shop now and stock up! OH MY GOODNESS! The Stitched Seasons Framelits are Back! They were only available during the Color Your Season August Promotion, but they're back now in the clearance rack! They were $33, but now you can get them for $19.80! I ABSOLUTELY LOVE the frame dies in this set! The frame dies have two rows of stitching! I used them all of the time during the promotion! Now that they're back for a little while, I'll be making some cards with them today! 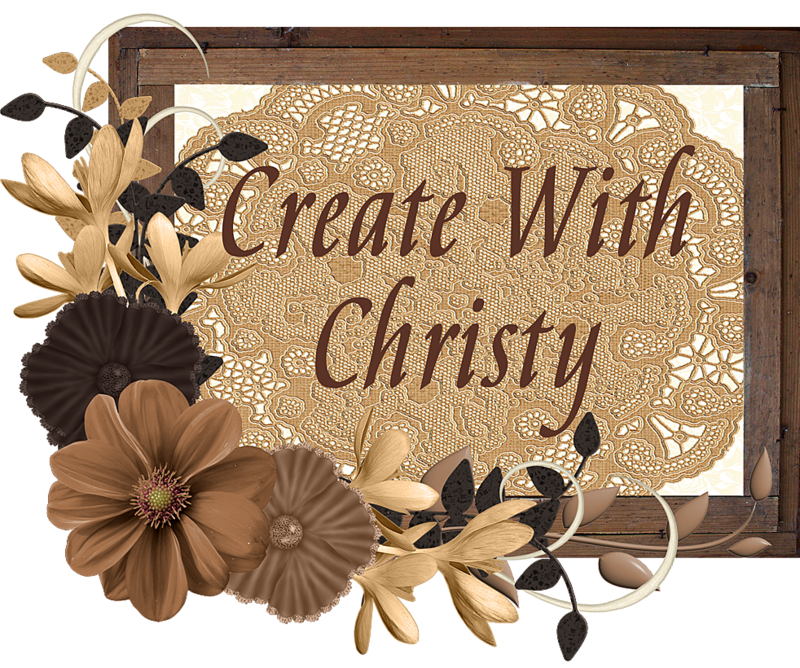 Come back tomorrow to see what I've made! Believe me, you NEED these dies! 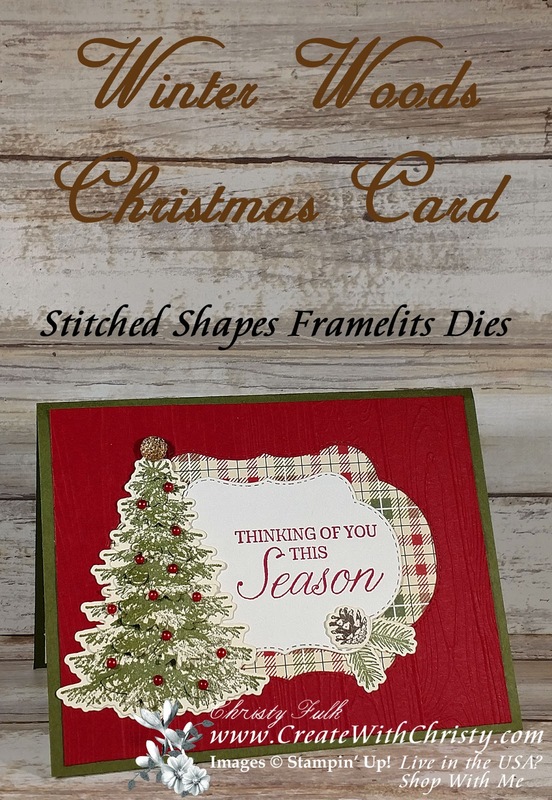 Stitched Seasons Framelits at Back AND At 40% OFF! Click the Picture to Get Them Before They Sell Out! Click to See Everything Else on the Clearance Rack! 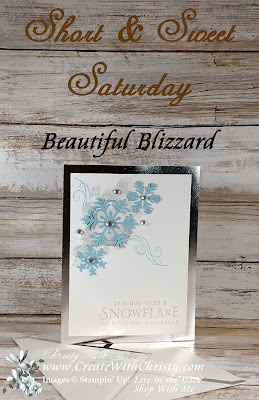 Here's this week's Short & Sweet Saturday card. 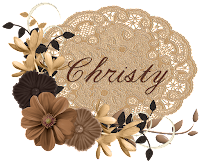 I used another retiring bundle from the Stampin' Up! 2018 Holiday Catalog called the Beautiful Blizzard Bundle. The bundle includes the Beautiful Blizzard Stamp Set & the Blizzard Thinlits Die. They can be purchased separately, but if you purchase them together as a bundle, you'll save 10%. The stamp set and die (and bundle) are only available until January 2, 2019 or WHILE SUPPLIES LAST...whichever comes first. Don't Forget About My Doily Rewards Program! Collect Doilies to earn a FREE $50 Shopping Spree...I'll even pay for the shipping & tax! 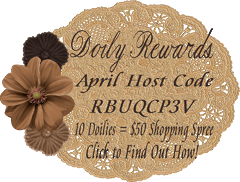 Click the Doily Rewards Host Code Picture Below the Supply List To Find Out How! Below, you'll find a video showing you how to make the card, along with a lot of helpful tips. I've also got the supply list below, along with the dimensions for the consumable supplies used on the card. 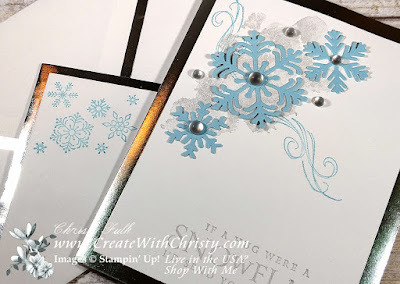 Balmy Blue Cardstock: 4" x 2"
I've got another quick and easy Christmas Card for you. 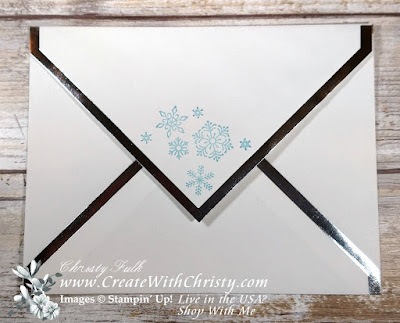 I've been making cards using some of the retiring products from the Stampin' Up!® 2018 Holiday Catalog, and this is one of them. 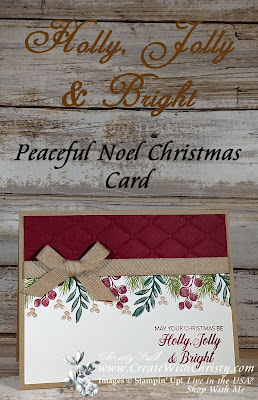 It features the Peaceful Noel Stamp Set. It's one of my favorites from the Holiday Catalog. 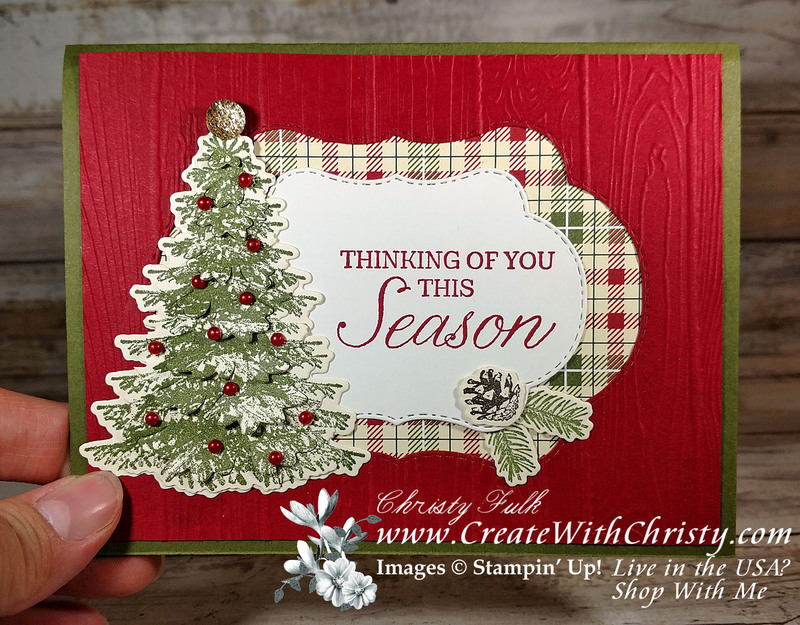 I love all of the branches, berries, and greetings in this stamp set! Below, you'll find a video showing you how to make the card, with pointers on how to stamp the berries & branches so they show up the right way under the embossed layer. I've also got the supply list below, along with the dimensions for the consumable supplies used on the card. New One Comes Out the 1st of Every Month. 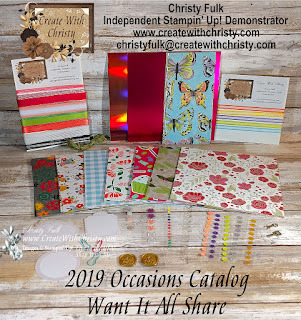 There's less than a month left of the Stampin' Up!® 2018 Holiday Catalog, and I want to make as many projects as I can using these wonderful products! There are so many retiring that I'm going to miss SO MUCH! You can see everything that is retiring, along with some items that are at a discount, by going to the YEAR-END CLOSEOUT SALE at my online store. 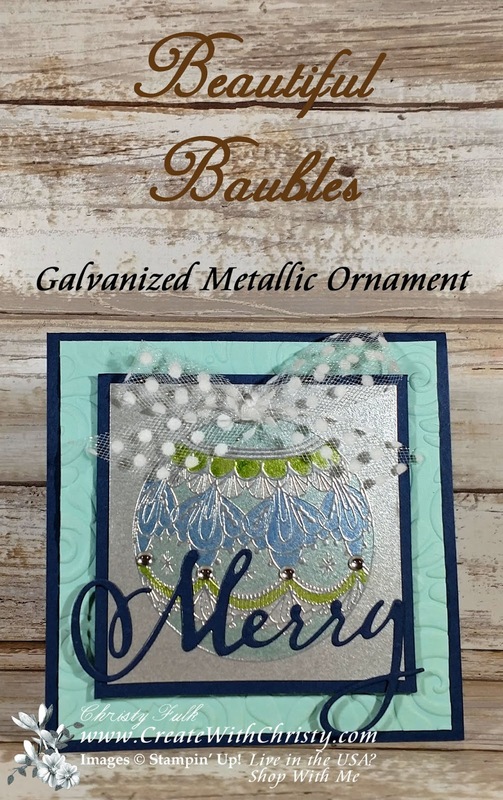 Today's card features two items that are retiring...The Beautiful Baubles Stamp Set and the Galvanized Metallic Paper. Isn't that ornament gorgeous? I'm REALLY going to miss the Galvanized Metallic Paper! There are so many things you can do with it! 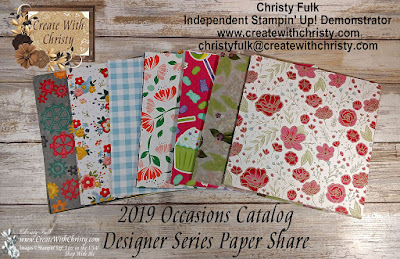 There's a great masculine stamp set and dies that are coming out in the 2019 Occasions Catalog that you'll definitely want to get this paper for. I'll make a card showing you why soon. 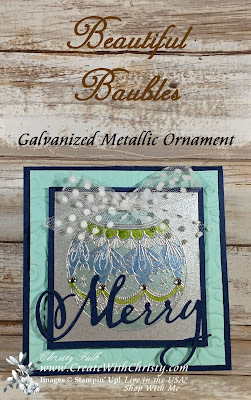 Below, you'll find a video showing you how I heat embossed and colored in the ornament on the Galvanized Metallic Paper (along with the other steps on how to make the card). I'm so in love with this look! I've also got the supply list below, along with the dimensions for the consumable supplies used on the card. 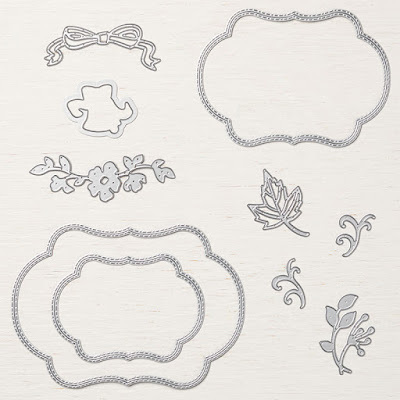 Multipurpose Adhesive Sheets: 4" x 2"
Whisper White 5/8" Polka-Dot Tulle Ribbon: 12"